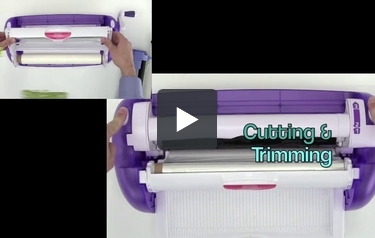 Xyron cutting systems make die cutting easier than ever. Using the Xyron Personal cutting system you can cut a massive number of awesome shapes and fonts by simply purchasing an electronic design book that plugs into your system. Or, you can use your Creatopia along with specialty dies to create awesome shapes. Either way, we carry the full line of Xyron cutting sytem accessories, blades, cutting mats, die sets, design books and more. Check them out below. MyBinding.com has a lot of Xyron cutting systems. These systems make die cutting easier than ever. The revolutionary Xyron Wishblade computerized die cutting machine can allow you to cut virtually any true type font or clip art that you want, which is exactly what the home crafter or scrapbooker needs. And if you don’t have a computer at home, you might consider using the Xyron personal cutting system. Using electronic design books, you can cut wonderful shapes, fonts and patterns in just minutes. There’s also Creatopia which allows you to cut and trim, emboss, stylize a laminate, turn things into magnets and stickers, just about anything can be done with this one machine. Here at MyBinding, we are proud to carry the full assortment of Xyron Wishblade and Xyron personal cutting system accessories in addition to the systems themselves. See for yourself. If you have any questions at all, just give us a call and our award-winning customer service will be there to answer your questions. When image matters, MyBinding.